The original Whitsunday Cruise, Dive and Sail Company, starting in 1985 - with Southern Cross Sailing Adventures. Today Prosail, Australian Tallships, Prima Sailing and Eureka Sailing specialise in overnight sailing holidays. Sail and dive the Whitsunday Islands and Great Barrier Reef Marine Park on a fully crewed sailing holiday. Choose from activities such as swimming, snorkelling, diving, guided island bush walks, or simply relax on the beach. The fleet offers a choice of Adventure Sailing holidays for the 18 to 35s with daily departures, Tall Ship and Deluxe Cruises, which operate in tours for couples or families of all ages. Explore Whitsundays Sail Training where you to learn to sail in Australia's premier sailing ground, the Whitsundays. Explore Whitsundays Sail Training conducts various maritime courses. The courses are for recreational or commercial purposes and meet the National Standards for Commercial Vessels (NSCV). Private Charters are available for couples to large groups, for Team Building, Education or Functions. 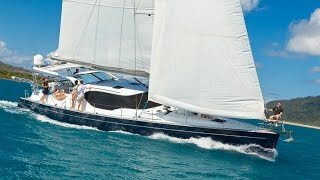 Adventure Catamarans Dive and Sail offer Catamarans sailing holidays in the Whitsundays. Whitsunday Blue is a modern eight guest catamaran for the couples market and offers two night or three night tours. For the adventure and family market, choice of a two day two night catamaran tour around the Whitsunday Islands on Whitsunday Adventurer or a popular option is a fast day tour on the power catamaran Whitsunday Bullet. Tours offer time to explore the islands, including time to relax at the magnificent Whitehaven Beach, walk to Hill Inlet Lookout on Whitsunday Island, and experience snorkelling stops on the fringing coral reefs which extend right from the edge of the Islands. Vessels include stand up paddle boards. The Captain and crew will provide interpretive information on the Whitsunday Islands and the Marine Park. Australian Tallship Cruises - Explore the Whitsundays aboard this famous Tallship built in Holland in 1902. Solway Lass has an amazing history, serving in the World Wars for both sides, and at different stages of her life has sailed in: Holland, Germany, England, Scotland, Ireland, Denmark, Fiji and Sydney Harbour. Since the 1990s Solway Lass has been lovingly maintained and today is in exceptional condition, with 10 air-conditioned guest cabins and a licensed bar and saloon. Solway Lass has 11 sails and guests are welcome to help, or relax and take in the unspoilt island views. This tour is available as a six day six night itinerary. Note the six night option consists of two three day three night cruises. Solway Lass recently had an interior refit in 2018 and has 10 guest cabins: two double/twin with en suites, one six share; three four share; three double/twin; one double with share bathrooms. Guests joining a cruise on Solway Lass can go snorkelling on coral reefs, take an excursion in their glass bottom boat, or can use for free the standup paddle boards. Their crew also offer guided island walks to spectacular lookouts and they visit Whitehaven Beach. If you are travelling on a budget, or have limited time, their two day one night sailing adventure aboard a Maxi Racing Yacht may be just for you. Hammer and Siska have been extensively refitted to accommodate up to 23 guests and two crew in open plan accommodation, double or single berths are available. There's also a large saloon/dining area downstairs, plus a large fully shaded cockpit on deck. These Maxi Yachts still sail fast, so they can get to the islands quickly, which means guests get to see more in just two days. Visit Whitehaven Beach, plus sail to the northern end of the Whitsundays for snorkelling. Introductory and certified diving is available as an optional extra. Guests are welcome to get involved with the sailing, have a turn on the wheel, get that terrific adventure photo, or just lay back and take in the scenery as they sail by the Whitsunday Islands. Join the French built Catamaran Whitsunday Blue for a two or three night island cruise, exploring the Whitsunday Islands and snorkelling on the fringing coral reefs around the islands. Small numbers only eight passengers for a relaxed and intimate atmosphere. Great for honeymooners. During your tour explore coral reefs teeming with marine life, swim in the tropical waters, bushwalk on the islands, visit magnificent beaches, and take the stand up paddle board on personal coral viewing excursion. Bliss - an Australian designed Jutson 60 luxury cruising yacht available for sailing holidays in the beautiful Whitsundays, heart of the Great Barrier Reef. Aptly named for the experience it provides, 'Bliss' sets a new standard in luxury yacht charter in Australia. Bliss provides luxury crewed charters, skippered by Peter Sheehy, an internationally experienced captain with a wealth of local knowledge. Bliss also boasts a fully qualified chef, indulging guests with the delights of local produce and freshly prepared gourmet meals, allowing the taste of the Whitsundays to tempt even the fussiest of connoisseurs. Join them on one of their two day two night Maxi sailing tours around the Whitsunday Islands. Choose between British Defender, Broomstick, Boomerang or Condor. Vessels are 83 feet long by 20 feet wide. Accommodation is open plan double and single berths. If you are up for a good time, and would like to meet other travellers then this tour could be just for you. With the Maxi's sailing pretty fast, you will get to see more of the Whitsundays in two days, including a visit to Whitehaven Beach, a guided walk to Hill Inlet Lookout, plus sail to the Northern end of the Whitsundays, around Hayman Island, Hook Island and Langford Reef where the most amazing coral reefs are located. Snorkelling on the reefs is included. 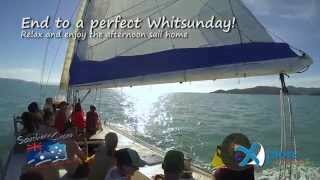 Explore Whitsundays Sail Training teaches you to learn to sail in Australia's premier sailing ground, the Whitsunday Islands. The Explore Whitsundays Sail Training conducts various maritime courses. Their Sail Training courses work for participants, whether they are learning for recreational or commercial purposes and meet the National Standards for Commercial Vessels (NSCV) and can offer IYT qualifications. Join one of the two day two night Sailing Adventures around the Whitsunday Islands. Tours are aimed towards 18 to 35s and the young at heart travellers looking for a small group adventure around the Whitsunday Islands. Tours provide time to really explore the Whitsundays, including Whitehaven Beach, plus snorkelling excursions on two or three different coral reefs, including the reefs at the northern end of the Whitsundays, around Hayman Island, Hook Island, Langford Reef. Plus guests will enjoy a guided island walk to the spectacular Hill Inlet Lookout. Guests on these tours are welcome to get involved with the sailing, have a turn on the wheel, or just sit back and relax. These yachts are maintained in exceptional condition and have been extensively modified downstairs to provide comfort for their guests. Interiors are open plan, with single bunks, and double berths. Bathrooms are share facilities. Large shade awnings are available on deck. An Introductory or Certified scuba dive is available as an optional extra. Prima provides a small group Sailing Adventure around the Whitsundays. Prima is a 47 foot Sloop built for Whitsunday Charters, lovingly presented and maintained. She is suitable for adventure seekers,couples, families and for private charter. Prima has four double cabins, two of the doubles have an en suite, two doubles have share bathroom. Two single bunks are also available and the dining table can be converted to a double. There is a comfortable saloon and dining area for relaxing. The cockpit has a shade awning and a deck shower with hot water.